My kids love smoothies, so a smoothie blender is an essential appliance in our kitchen. Smoothies blenders can also make butters, salad dressings, soups, grind nuts and coffees, crush ice and loads more. After my little wine fridge, it’s my favourite appliance. We have been using the best smoothie blender for quite some time now and haven’t had a single regret. It’s been reliable for when I lack the time for a proper meal preparation, plus the kids enjoy it too. There are hundreds of smoothie blenders on the market and randomly selecting a model may see you waste your money. Before purchasing a smoothie blender consider what you will use it for and how often. Click here to see the best smoothie blender now. In order to help you wade your way through the various models available, we have reviewed a range of the best smoothie makers 2019 Australia offers. 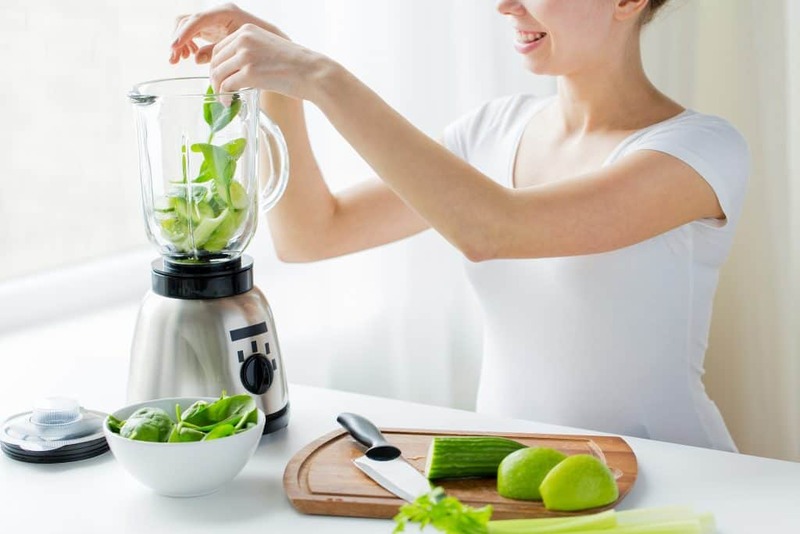 Whether you are looking for a smoothie blender to make the odd smoothie or something to use on a daily basis to help make delicious and healthy meals for your family, we are confident you will find it in our best blender reviews Australia below. 3 What Are Smoothie Blenders? 5 What Can The Best Smoothie Makers Do? Use the table below to compare smoothie blenders to help you find the best buy smoothie maker. Handy reference list – see all smoothie blender reviews below! A smoothie blender is designed to be powerful enough to blend a variety of fruits, vegetables, nuts and even ice into a silky smooth delicious drink in a matter of seconds. Simply choose your ingredients, place them into the blender cup, put on the lid and choose a setting to whiz up your ingredients. As mentioned above, smoothie blenders are the perfect appliance to make a range of other healthy meals in the kitchen. Smoothie blenders are perfect for making healthy salad dressings, nut butters, soups and more. Smoothie blenders are also great for whizzing up fruity cocktails! Health Benefits – The best smoothie blender is a great way to up your intake of fruits and vegetables and can be particularly helpful for people on a weight loss or detox program. Freshly made smoothies can help improve your fiber intake, both insoluble and soluble, which is great to improve your digestion. Quick, Delicious, On-The-Go Snack – Don’t have a lot of time? The best blender will take next to no time to make a delicious and healthy smoothie, particularly if you prepare your ingredients in advance. Chop up a bunch of fruit and vegetables and freeze them in zip lock bags, then simply pour the frozen contents of the bag into the blender, blend and drink. Kids Love Smoothies – Smoothies are a great way to get your kids to eat more healthy snacks – whizz the kids up a delicious, yet healthy smoothie in next to no time! Your kids will love experimenting with different fruity combinations. Simple and Fun – Experiment with all your favourite fruits and vegetables, whilst combing your not so favourite ingredients with ones you love to ensure the maximum intake of fruit and vegetables. Read any of the best blender reviews and you will hear how people love making their smoothie recipes and sharing them with friends. Create Your Smoothie Anytime – A smoothie is a great way to have a meal on the go. No time for breakfast? With your pre-prepared ingredients, throw them in the blender, blend and take your smoothie with you to consume on the way to work or to take the kids to school. What Can The Best Smoothie Makers Do? There are no rules when it comes to making a smoothie. You can throw in pretty much anything you have in the fridge, pantry or fruit bowl. It is often best to start with a few tried and tested smoothie recipes to ensure they taste delicious, but after that start experimenting. Some of the more popular fruits to start with include frozen mango, strawberries and banana whilst adding a combination of ingredients such as yogurt, milk (try coconut milk or almond milk), water and ice cubes. If you prefer green or vegetable smoothies try adding carrots, spinach or kale with fruits such as oranges, bananas and apples. Blenders can use quite a lot of ingredients to make a smoothie which can get expensive, so it is best to use seasonal fruits and vegetables. 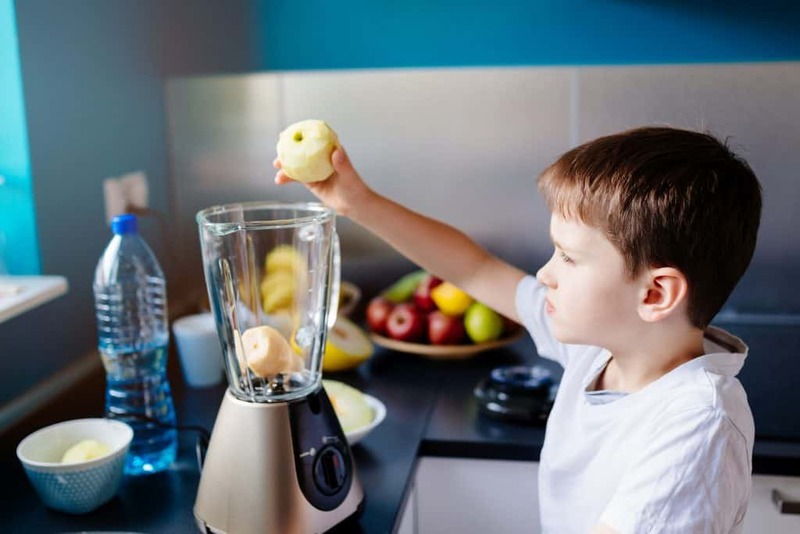 Before racing out to buy the best blender for smoothies, it is important to consider how many people you will be making smoothies for, this will help determine the best smoothie maker Australia offers you. Will you be making one smoothie at a time? Or do you want to make enough for two people at once? Or perhaps the entire family? Most smoothie blenders have capacities between 500 ml to 2 litres. Be sure to buy a blender large enough for your needs. The ability of a blender to create silky smooth smoothies depends upon the power of your blender. This is generally measured in watts. Whilst the best stick blender might be a cheap option, it probably won’t create the best consistency smoothies (check stick blender reviews Australia for the best option). The higher the watts of power the smoother consistency your smoothies will be. For the best results, choose a blender over 800 watts. Read any smoothie blender reviews and you will note that there are a range of different blender features available. Consider speed controls, pulse buttons, the number of blades and various preset options. It is also recommended you purchase a smoothie blender that is easy to clean and is dishwasher safe. This Nutri Ninja blender is an excellent smoothie blender enabling you to create various delicious drinks, milkshakes, purees, dips and sauces. All this is possible with a touch of a button using the Ninja’s Auto-IQ and smooth boost technologies. Some of this blender’s features include a 1.4 litre jar, super powerful motor at 1100 watts and pro-extractor blades that rotate up to an incredible 20,000 RPM – a hugely powerful Australia smoothie blender. 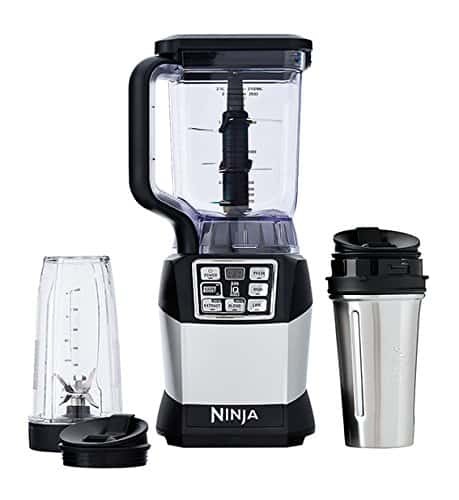 Read any of the Ninja blender reviews and you will see that people love the quality of the Ninja smoothie maker, claiming it makes perfect silky smoothies and that the blender itself is durable and robust. One reviewer claimed they couldn’t believe how much quieter the Ninja was compared to the NutriBullet. The Ninja professional blender comes with a variety of cups including a double wall stainless cup which will keep your drinks cold for up to 4 hours. You also get several sip and seal lids which are perfect for having your smoothies on the go as well as a book with 30 recipes. NutriBullet are well known for making some of the best quality cheap blenders and the NutriBullet PRIME is no exception, in fact some people are claiming that not only is this NutriBullet’s best bullet blender but the best high speed smoothie blender overall for personal use. This blender has plenty of power with it’s 1000 watt motor, which will easily blend up a variety of fruit, vegetables, nuts and seeds. For people looking to buy blender for smoothies on the go, the PRIME is perfect as it comes with not only two cups, but also a stainless steel insulated cup designed to keep your drinks cold for up to 8 hours. Perfect for making that after gym session protein drink! It also includes various lids, including flip top lids, as well as a recipe book. Other great features of the PRIME blender include being dishwasher safe and the built in auto-shut off so you can set and walk away – the blender will turn it self off once ready. The NutriBullet PRIME is a great choice for people after the best single serve blender to make delicious and healthy smoothies. Another NutriBullet review – they really are great! The NutriBullet Pro Blender is the best small blender available and perfect for making a smoothie for one to two people, or for making purees. Despite being a small blender, the NutriBullet Pro comes with a powerful 900 watt motor and quality blades able to break down the toughest ingredients. The unique cup design is perfect for smoothie drinkers. Simply throw the ingredients directly into the cup, blend and drink. Its also super easy to clean too, requiring a rinse of the cup and put it in the dishwasher. Reading the smoothie blender reviews, specifically the bullet blender reviews, people love the included cups and and lids that come with the blender; particularly the flip-top lids which are perfect for people wanting to drink their smoothie on the go. The NutriBullet Pro is a great low blender price and is perfect for those looking for not only a small smoothie blender but the best cheap smoothie blender too. Breville makes some top smoothie blenders, and the Boss to Go is no exception. The Boss to Go features a slim, modern design and the ProKinetic Blade and Bowl System, which includes 3 powerful stainless steel blades which are contoured at the base of the jug for maximum cutting power and silky smooth results. Great for being the best blender for ice, and the toughest fruit and vegetables. Other features of the Boss to Go include a powerful 800 watt motor and a heavy duty, die-cast metal base. This Breville blender comes with two unique smooth edged cups with travel lids, perfect for having your drinks on the go. The cups and lids are also dishwasher safe making it a great choice for the best personal blender. If you are are wanting a great quality personal blender to buy blender online, the Breville Boss to Go is a great choice. If you like this but want even more power, check the Boss to Go Plus below. What is the best blender for super fine blending? According to a test conducted at the Sydney University in 2015, the Breville Boss to Go Plus is possibly the best blender on the market. The test found that the Boss to Go Plus blends up to 27 – 42% finer than other personal blenders on the market. This is aided by the blender’s powerful 1000 watt motor and it’s ProKinetic Blade and Bowl System which uses 3 powerful stainless steel blades. Great for being the best food blender for cutting through the toughest fruit and vegetables as well as nuts and seeds. This Breville blender comes with two unique smooth edged cups with travel lids, perfect for having your drinks on the go. The cups and lids are also dishwasher safe making it a great choice for the best home smoothie blender. Reading the smoothie blender reviews and other personal blender reviews you will see numerous people commenting on how excellent it is compared to other best Australia smoothie blenders they have owned. This really is an outstanding quality kitchen appliance that can do so much more than smoothies. The Blendtec blender is the best blender to buy for anyone looking for a top quality commercial smoothie blender. This blender is one of the most powerful blenders on the market and, with its 1560 watt motor, it is the best smoothie blender for crushing ice and frozen fruits as well as softer fruit and vegetables. The Blendtec will absolutely pulverize anything you put in it! Other great features include the easy to use illuminated touch interface, built in cooler heads which will shut the blender down in case of overheating, self adjusting speed, rubber feet to keep the appliance in place and an included recipe book with more than 230 great recipes. The Blendtec blender comes with a 90 ounce BPA free jar, also known as the Wildside Jar and comes in three great colours – black, red or white. If you want the best smoothie blender for the money at a top quality, the Blendtec Blender is for you. If you are looking for the absolute best smoothie machine money can by, than the Vitamix Total Nutrition Center Blender is for you. Whether you are a top chef, restaurant owner or just a cooking enthusiast, you will love this blender. This is not the blender for you if you are after the best budget smoothie blender, but it is the best Vitamix blender. This is a top of the line blender with a hefty price tag to match but is by far the best blender for green smoothie, silky soups and purees and not only does it blend but it cooks soups, grinds nuts and coffee, mixes batters and dough as much more! It has some great features including variable speed control which you can change during the blending process to achieve a variety of textures. The 8 cup container is perfect for medium to large batches, and it has an in built cool-running system to prevent overload and burnout and it is super easy to clean. It is also built with top quality materials, so it is built to last – you won’t be needing to replace this anytime soon. 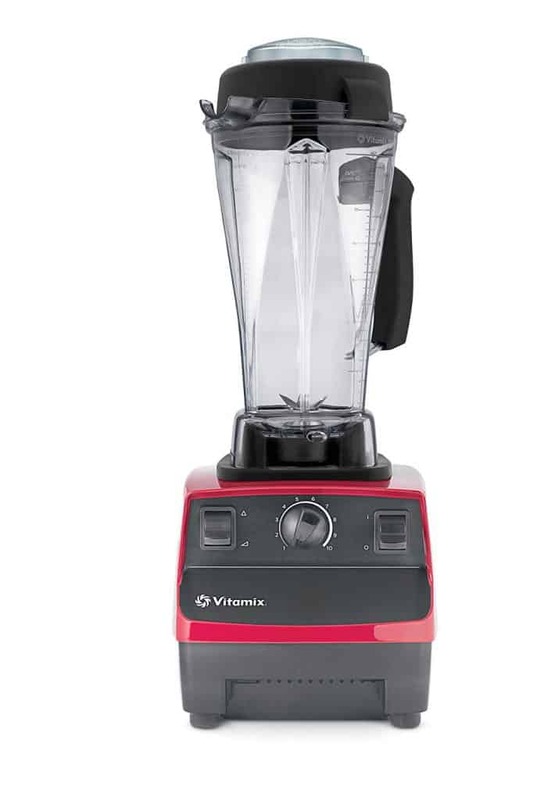 The Vitamix professional series is well known as the best performance blender. If you are just after a good cheap blender, the best blender to buy is the Kenwood Blender, the cheapest on our recommendation list. It is also good for the best juicer blender combination. Whilst this is a budget blender, in terms of blender comparison, it is good little blender. Unlike some more expensive blenders, the Kenwood has 2 speeds and a pulse function to help you blend, crush, chop, grind and mix a range of ingredients. These features help you be in control of the consistency and make soups and smoothies just the way you like them. For the ultimate in convenience, simply whizz up your favourite ingredients in the 500 ml cup, then remove it from the base, add a lid and away you go. This blender is simple and easy to use as well as clean. The Kenwood is the ideal appliance for the health conscious individuals looking for a cheap no fuss blender. Whilst the Breville Kinetix Control Blender is a great choice for the best smoothie blender, it is an even better choice if you want to do a little more than just make smoothies. Whilst not necessary the cheapest smoothie blender, for the amount of built in functions, it is a great option. This Breville blender uses the Kinetix blade and bowl system with central blades drawing down the ingredients and with extra wide sweeping blades hugging the bottom of the large 1.5 litre jug pushing ingredients up, ensuring you get the correct consistency no matter what you are whizzing up. This is a powerful blender with 1200 watts of power, with other great features like 7 task controls including a ice crush function and smoothie setting, and as well as an LCD timer displaying speed and pre-programmed settings. The blender crushes and chops, turning ice into snow for fruity cocktails and also folds and aerates for creamy smoothies and soups all whilst making far less noise than similar blenders. 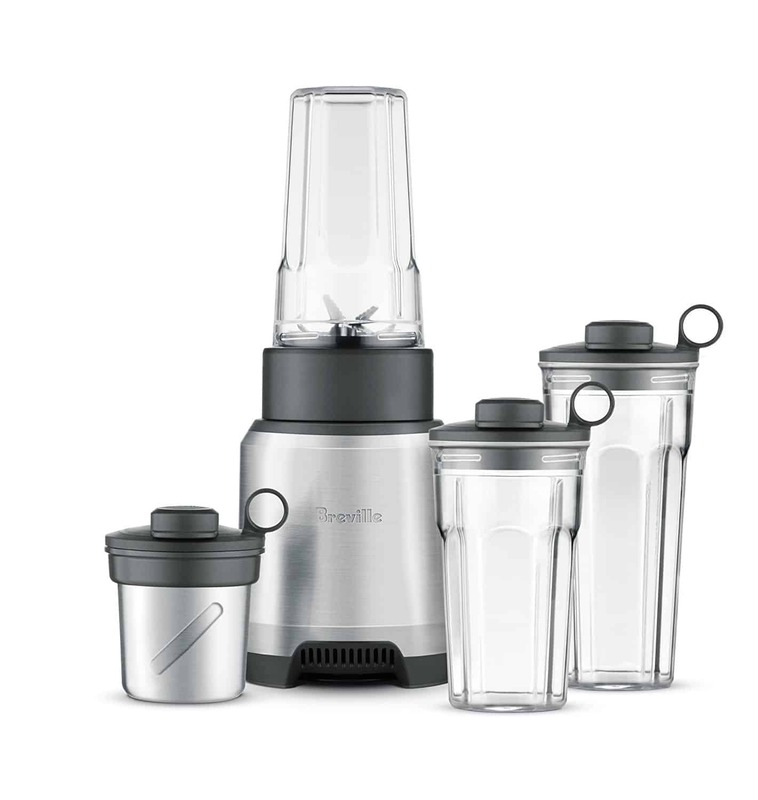 Breville are of course a great choice if you are wanting the best smoothie maker brand, and with the various functions available on the Kinetix Control Blender, this blender offers a great choice for the best value blender too. The 2-in-1 Davis & Waddell blender is not just a smoothie maker, but whizzes up delicious juices too and is also one of the small appliances that can be used as a food processor. The Davis & Waddell mixes, blends, chops and grinds various ingredients, whilst as a blender you can blend your favourites fruit and vegetables to create delicious and healthy, quick smoothies and juices. What is the best blender for smoothies on the go? One where you can make your smoothie directly in the cup you will drink it from, all of the top 10 blenders for personal use offer this as does the Davis & Waddell blender. Included are two 570 mm travel silicon grip tritan bottles with sip and seal lids and carry handles so you can drink your smoothies and juices on the go. This blender has a capacity to mix, blend and chop up to 1.2 litres of ingredients, with other features including a quiet 500 watt motor and a 4 blade design in order to crush ice and nuts. Whilst certainly not the best commercial blender, according to smoothie maker reviews, the Davis and Waddell blender is an excellent home appliance at a great price. 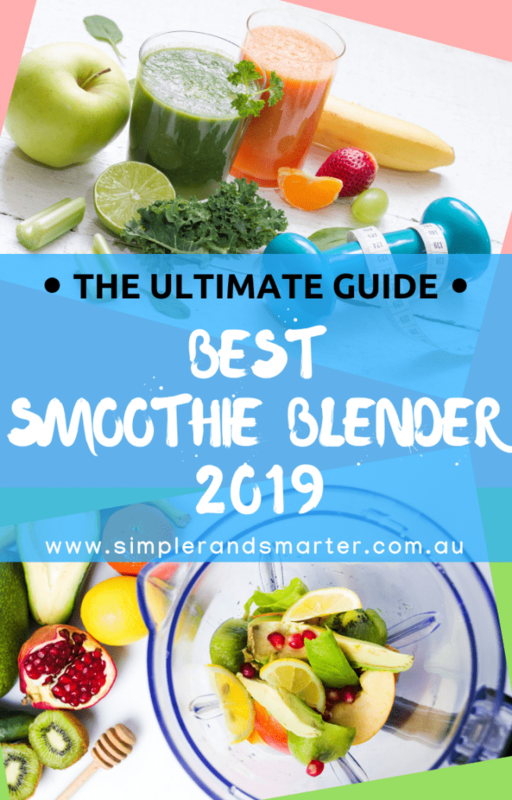 We couldn’t do a full list of the best blender for smoothies Australia offers without mentioning the OmniBlend – the very best commercial smoothie blender. Although this isn’t strictly a smoothie blender, it regularly features as the best blender Australia has to offer. The reason for this is among the best blenders for smoothies, this particular model is incredibly powerful – many of the best smoothie maker reviews report this being the most powerful blender they’ve ever used. There’s several speed settings which allow you to do anything from chopping and dicing to blending even the most stubborn fruits and vegetables. What’s more, this particular smoothie maker Australia is self cleaning, includes a full warranty and and can finish automatically. It’s simply the best high speed blender Australia offers. Coming in as perhaps the best small blender for smoothies is Cuisinart. What makes this one of the best blenders for smoothies Australia is it’s versatility – you can chop and dice in addition to making smoothies. This smoothies blender feels more like a high tech gadget than kitchen appliance, with a touch-pad and LED lights, as well as a stainless steel, modern exterior which seamlessly blends into the kitchen. At just 350 watts, one wouldn’t assume this to be among the best smoothie makers, but with super powerful blades it packs a punch. Not to mention cleanup is a breeze as all pieces are dishwasher safe. Looking for other cooking appliances? Read about the best juicer and check out our other buying guides here.